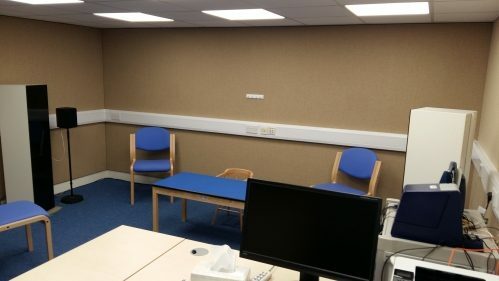 AGS Noise Control were commissioned by Dorset University NHS Foundation Trust to provide a new paediatric audiology booth for a local health centre in Poole. The chosen location for the new booth, next to the main entrance and reception area presented some challenges to ensure the booth complied with the acoustic requirements of HTM 08-01 and ISO 8253-01: 2010. The restricted clear height of the host room offered further challenges as it was impossible to install ceiling mounted ventilation equipment. 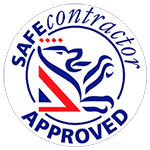 Following an initial site visit and evaluation of the client’s requirements a number of proposals were considered by the trust. Following detailed evaluation of the options, a room design with a wall mounted fresh air supply was selected. 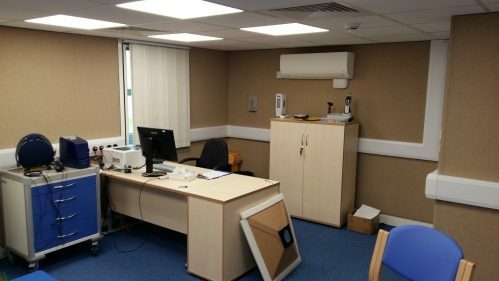 The installation, including floating floor, acoustic wall and ceiling panels, acoustic doors, internal fabric wall linings, carpets, suspended ceiling and electrical installation was carried out by AGS Noise Control with the health centre still in use with the minimum of disruption to staff or patients. 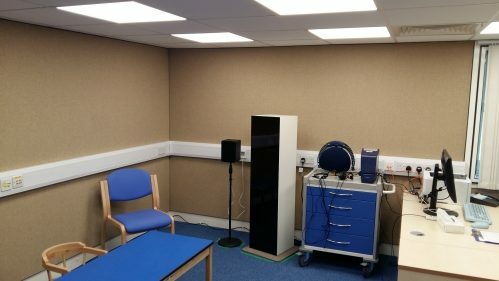 Post installation acoustic assessment, undertaken by an independent acoustic consultant confirmed the new audiology booth met the requirements of ISO 8253-01: 2010 and HTM 08-01. 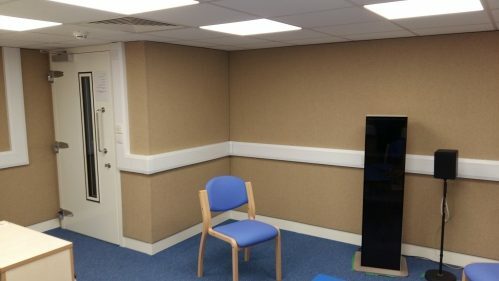 Audiology room with fabric covered acoustic walls and an acoustic door.